My seed order came in the mail last week. We get most of our seeds and seedlings from the PHS Growers Alliance, but they are supporting lots of other gardens in the city in the same way, and we can't very well hog all the resources. So this month we'll be starting some things indoors, as always, on our high tech "growing stands," which are really just a pair of wooden shelves, skillfully crafted from two-by-fours and plywood. They are exactly the width of our "grow lights" (read industrial hanging flourescents) which always makes for a frustrating time putting the whole thing together- shoving the sharp metal fixtures in between the posts, then trying to unjam them each week as we raise the lights to make room for the growing plants. I shouldn't complain, because it actually works quite well. It's compact (each stand is 2 feet deep by 4 1/2 feet wide or so), so it fits snugly against the wall and doesn't jut out too far into things. Each fixture hangs from the shelf above it, so all of the plants get nearly equal time and aren't competing too much for the light. We even have special heat mats for the warm weather lovers, which were an investment years ago that I do not regret. Now, to keep the cat from becoming interested, that's the challenge this year. This whole setup is in our bedroom. I've got this great new desk that has all kinds of little cubbies that are perfect for seed storage. I labeled each cubby with the latin name of a crop family and put each packet in its appropriate cubby. This keeps me on my toes and makes me feel very organized. I made some very large purchases this past month. 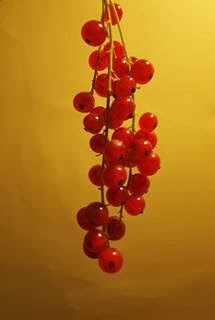 I placed an order last week for 18 currant bushes (6 red, 4 black, 4 pink, and 4 white) and 12 gooseberries (drawing a blank on which ones), which should be arriving in time for early spring planting. These bushes tolerate partial shade, and I'm so happy to be able to use our shadier spots for something edible. Last summer I fell in love with red currants. The black ones will take some getting used to, unless I come across a food dehydrator for my birthday (ahem), in which case I can make lots of scones. And finally, the fruit tree order has been placed. Yesterday I ordered 32 dwarf fruit trees, which I plan to prune to espalier along two fencelines in the area we've been calling an orchard for 3 years. Eight apples (Wine Crisp, Winter Banana Antique, Cox's Orange Pippin, and Honeycrisp), 8 peaches (Redhaven, Blushingstar, Burbank July Elberta, and 4th of July), 6 pears (Tyson, Moonglow, Beurre Bosc), 4 Plums (Starking Delicious, Shiro), 4 Brown Turkey Figs, and 2 sweet cherries. So, who wants to help prepare the site when all this snow melts?